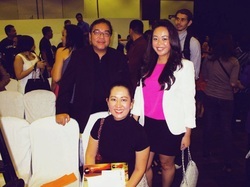 Abby Jimenez is a former chairman of Publicis JimenezBasic (sometimes Jimenez Basic), an advertising agency in the Philippines.Jimenez and her husband Monet Jimenez were featured on the cover of Adobo Magazine in February 2009. Her firm Publicis JimenezBasic with 120 employees manages advertising accounts for Philippine brands such as Decolgen,Jollibee,Skyflakes, and Lucky Me,and for clients such as Unilab,Greenwich Pizza,and Manila Bulletin.Her firm has done public advocacy campaigns including one to encourage Philippine families to eat meals together. She has been a judge for advertising awards including the Tambuli Awards sponosored by the University of Asia and the Pacific. She has been a speaker at industry conferences.She is the mother of Philippine fashion designer Sassa Jimenez.In 2007, her agency was named Agency of the Year.